I had a look back earlier too. Very surprising to see it fly over the head of some I thought better of. 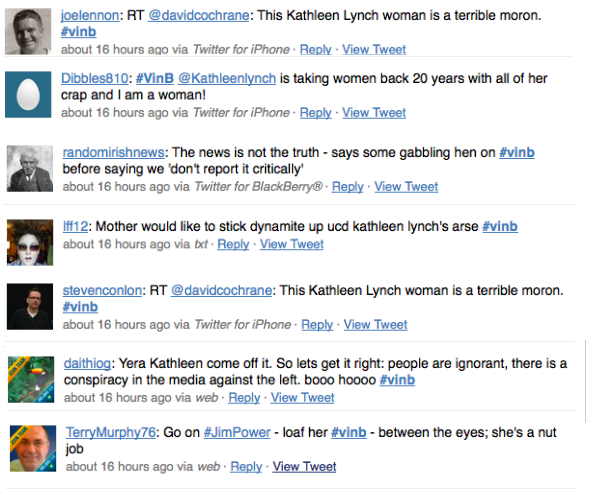 Very sad, how many times the word ‘woman’ was used as some sort of insult..
You know the 41% who voted FF in 2007? And you know that no one saw the crash coming? Right? Sophisticated electorate they call us. And we lap it up. It was reactionary both on the panel and on Twitter. A complete refusal to engage with or even entertain the argument. Which sort of proves her point. It is shocking looking at the responses that as you say ‘woman’ was used as some sort of insult. 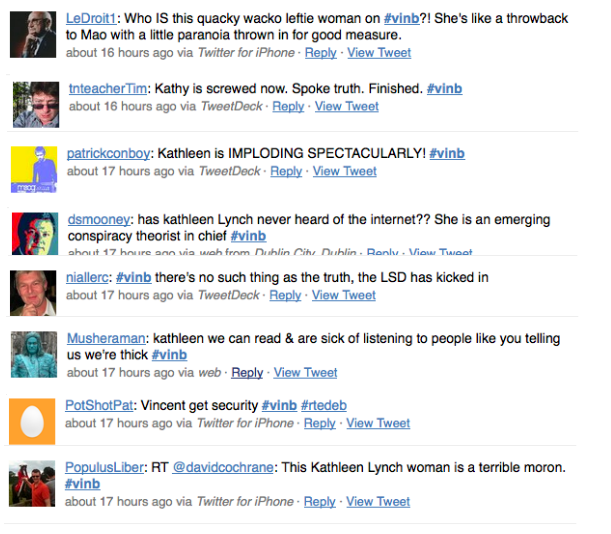 I agree with most of Kathleen Lynch’s remarks last night. I think people do believe everything they read in mainstream media. If you go and read decent, well informed blogs like Politicalworld.org, Namawinelake, the propertypin, boards.ie, politics.ie and many more like it, they would see what is being dicussed and very little of it makes its way to mainstream media (like what some people reckon REALLY went on in Anglo Irish Bank). There are, imo, better journos writing on these blogs by and large. The information is out there, just dont expect to see it in the Independent, the Irish Times, or especially RTE. Go look them up and you will see. 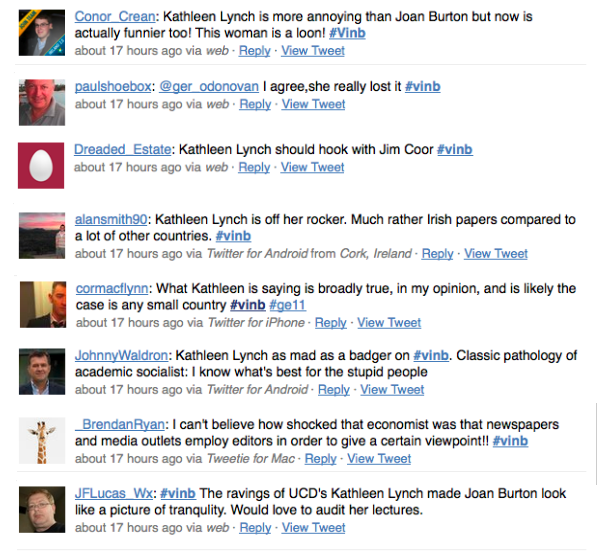 Also, comments about Kathleen being of a socialist leaning, like it was some kind of a disease,it is disgusting. Many people in Ireland are absolute clueless sheeple. The newspapers DO have their own agenda, she is right about that. Go look at Max Keiser, a very good economist, and what he is saying about Ireland and our takeover by financial terrorists. Honesty, I am starting to think we are getting EXCATLY what we deserve. We are laughable and the world is laughing make no mistake. I am out of this godforsake place as soon as I possibly can. So many small minded people who believe all the crap they are fed. So go on, take your pay cuts, lie on your trolleys, pay your tolls to private companies, pay the bankers their bonuses. Cough it up SHEEPLE. Very telling as to the state of public debate in Ireland. Where else, other than in here, would you get a mob reaction like that to someone who makes an observation that in most western countries is seen as orthodoxy. Looks like a lot of people here are still in the Galway tent. I agree that there is a mob effect on Twitter but it can work either way…and to be honest I think it’s more usually leftwing mobbery than rightwing mobbery. Also, I wouldn’t be so quick to say that the Chomsky thesis of control of the media by interests is orthodoxy. Newspapers are in the business of making money by renting your eyes and mine to advertisers. Newspapers who don’t provide readers with content they want eventually fail. I don’t buy The Telegraph, for instance, because I think it’s a Tory rag and I sorta know the line they’ll take on a given issue. I know there are people who do buy it for the exaxct same reason- do you really think Fox News changes people’s minds or like I, do you think it just confirms their prejudices and massages their egos when they see so-called experts verbalising the semi-formulated ideas they already have. Finally, on the sexist thing…if I say KL is a dumb woman, is it sexist? Perhaps I just think she’s a woman who happens to be dumb. I’m a bit tired of this sexist card being played…Am I a stupid man? ..
Wasn’t it just? 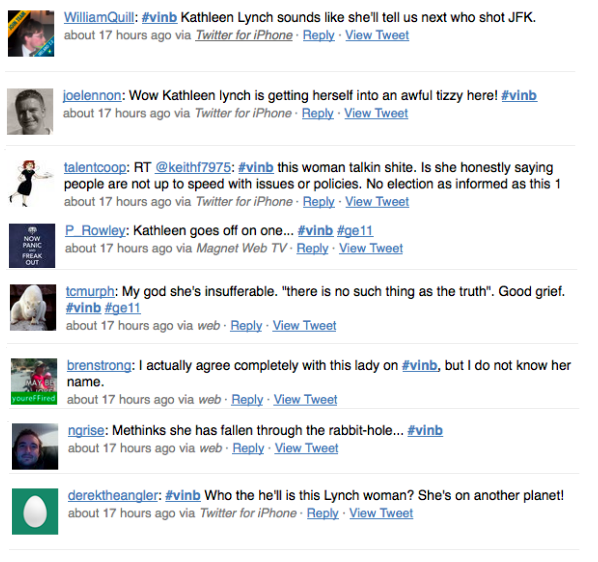 Though it was heart-warming to see old and new media combine in their condemnation of this “terrible moron”. I didn’t comment on the sexism, which is clearly inherent in some of the comments. If you have a close look at the selection above you’ll see quite obvious differences between insults and sexist insults. 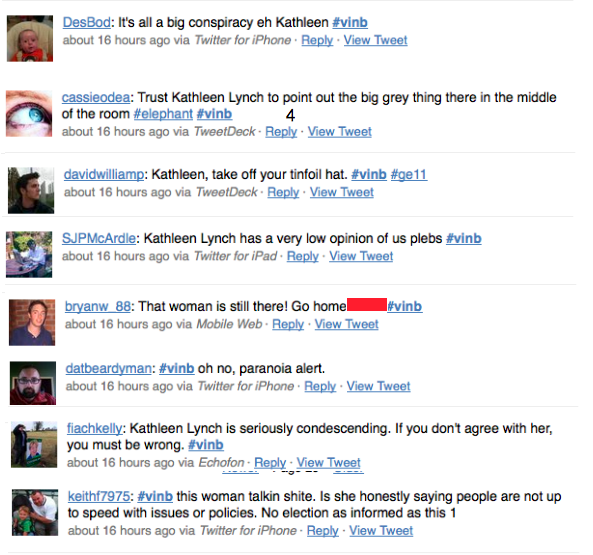 Although one might make the case that collectively the Twitter ‘storm’ engaged in sexist bullying as all the comments were intended for perusal under the #vinb hashtag, and so could be potentially read aloud on air. Thanks for the links, but (sorry to say this) I can’t help but feeling that the last post was a bit condescending. As one tweet pictured in the article says… “if you don’t agree with me, you must be wrong”. I know Chomsky’s thought on media output is articulated, nuanced and not so simple as to be summarised in a single phrase, but the effects of the ownership structure seemed to be the main point KL was making. 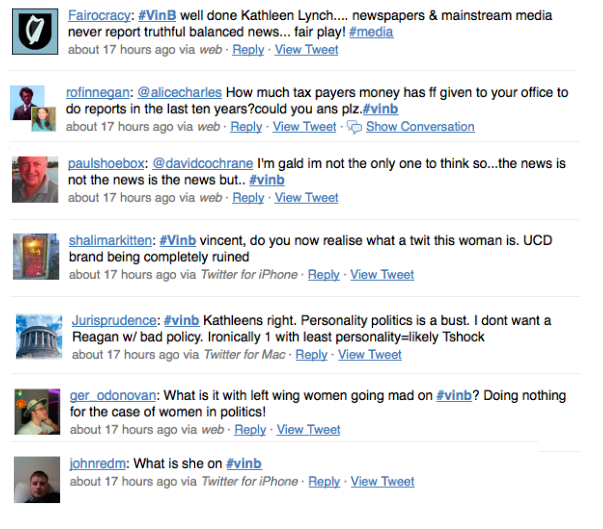 Also, I do believe the idea that INM’s funding of the Tribune was withdrawn now because of the proximity of the election is a bit OTT: I mean, who knows, but “I have a suspicion” or whatever she said is a bit X-filesy. I’m not saying there wasn’t any sexism in the comments either (“gabbling hen” is a pretty bad example)although I think it’s overstated. Also, I think it is illogical to say the group as a whole engaged in sexist bullying. I understand the argument that there may have developed a group dynamic and twitter surely lends itself to people trying to be more controversial and/or amusing than the next but the word “collectively” always give me the shivers: If I had tweeted a disparaging but non-sexist remark about KL while watching the show, how on Earth could I have been accused of participating in collective sexist bullying? 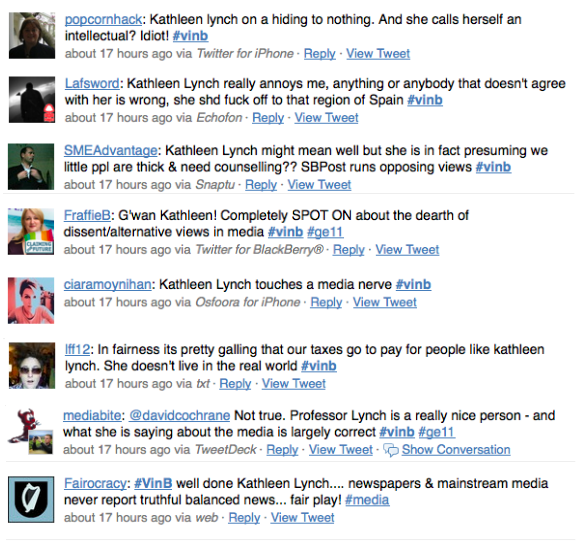 The point about the media luvvies closing ranks however is highly relevant, even more so in the incestuous fishbowl that is Dublinmedialand. Sorry Paul, I didn’t mean to dismiss your comment. I had initially launched into writing a comment in response, but scrapped it at the last minute as it was going nowhere fast. But to go back to your point. I think you are overstating the diversity of mainstream media and the differences between various outlets. It’s easy to point to extremes like Fox News and Bill O’Reilly but if you look closely at the style and content of reporting on say the Fox website and compare it to that at the BBC the differences are not as glaring as you might expect. There are the foaming at the mouth commentators such as Beck and perhaps, arguably from the other end of the spectrum, Olberman. But Chomsky and Herman point out that this spectrum is narrow enough just to give the illusion of diversity. To take the major news story of the decade, the Iraq war in March 2003, the mainstream news outlets were almost unanimous. There was of course a gap for dissent, but it was marginalised in all cases, and to an extent it still is, even with what we know now. There’s many blatant examples of media owners overtly influencing coverage, spiking negative articles where they conflict with other business interests (and the opposite) etc. But I think the simple point that Kathleen makes is that concentration of media ownership in the hands of an elite few has a fundamental shaping effect on reporting, all Chomsky’s other insights go hand and hand with this one influence. Journalists know what Rupert Murdoch does and doesn’t want to read, to what extent that dictates what they write can only be determined by examining the coverage, but just as with any business, employees, even the most independently minded, naturally gravitate towards what they know their bosses want to see, if they want to keep their job that is. With respect to the argument that the market provides what people want, I have yet to find a news publication in Ireland that I want to spend my money on, and if friends, family and internet acquaintances are anything to go by I am not alone. As far as the sexism goes, its difficult to say without detailed analysis. And in the end I think it would ultimately be impossible, as there are too many unknown factors. 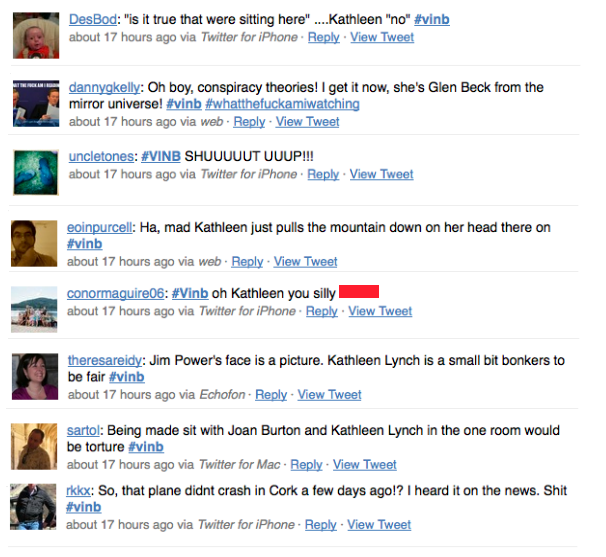 We would have to determine the exact timeline, who follows who, who is watching the #vinb hashtag in real time, which tweets people are responding to etc. But one important thing to take into account is that very few people challenged the overt sexism. No surprise commenter has heard and repeats the message loud and clear. It only reinforces the impression that much, if not most, of the so-called left is totally incapable of political analysis. Who are “we” and why do “we” deserve what has been inflicted by a cabal of criminals? No one saw the crash coming? Really? I was able to see it way back when, and I’m not an economist. So why couldn’t you?